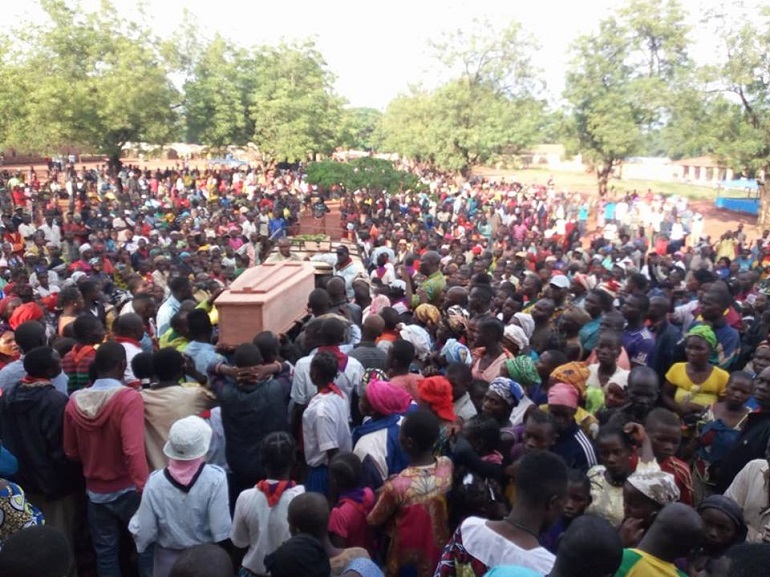 The Catholic Church in the Central African Republic is again in shock after the killing of the vicar general of Bambari, in the centre of the country, on Friday night. Father Firmin Gbagoua, 52, was fatally wounded, when unidentified gunmen stormed the presbytery of St. Joseph’s Cathedral of Bambari at around 7pm. The assailants, said to be in large numbers, infiltrated the compound, asking for money, Msgr. Nestor Nongo Aziagbia, vice-president of the Episcopal Conference of the Central African Republic, told World Watch Monitor. As Fr. Firmin had no money and in order to preserve the lives of his colleagues, he invited the armed men to follow him into his bedroom and take what they wanted. Witnesses said they then heard raised voices, followed by a gunshot. The UN peacekeepers, whose checkpoint was just 300 metres away, arrived at the scene only after the assailants had escaped. Fr. Firmin Gbagoua was buried on Saturday afternoon in the missionary cemetery of Saint Joseph, in Bambari. As the vicar general of the Diocese of Bambari, Fr. Gbagoua had been at the front line of interreligious efforts between Christians and Muslims. Some believe that this commitment may have earned him enmity among some people. His killing is the latest of a series of attacks targeting Catholic priests in CAR. In May, Fr. Albert Tougoumalé Baba was killed when armed men stormed the Parish of Our Lady Fatima, in Bangui. Father Baba, 71, was also known for his commitment to peace and was secretary of the Commission for Justice and Peace of the Archdiocese of Bangui. In March, the same Diocese of Bambari lost another cleric – Fr. Désiré Angbabata, parish priest of Séko village (about 60km from Bambari), when armed men believed to be militants of a Séléka off-shoot, l’Union pour la Paix en Centrafrique (UPC), a mainly Muslim and Fulani militia, attacked his village. The UPC has been responsible for numerous massacres and human rights abuses, including the killing of ten Red Cross workers last year in Gambo. In January, Fr. 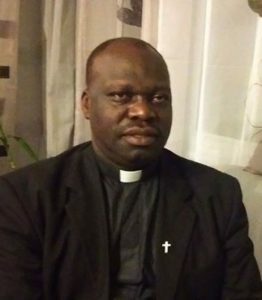 Alain Blaise Bissialo from the Diocese of Bangassou was severely wounded and left for dead, but he survived his wounds and is now recovering in France. Fr. Bissialo is the president of the Bangassou Peace and Mediation Committee, in the southeast of the country. The Episcopal Conference of the Central African Republic strongly condemned the successive killings of priests. “Who, therefore, takes advantage of all this violence against the Catholic Church in the Central African Republic?” asked the bishops in a statement issued on Saturday. They also urged “the whole Christian community to remain calm and in prayer so as not to fall into the trap of those who want to show that Christians and Muslims can no longer live together in order to create the partition the Central African nation”. After the assassination of Fr. Albert Tougoumalé Baba in May, two mosques were burned down by an angry mob in Bangui. Further acts of revenge followed, prompting various calls for calm and restrain from religious and political leaders. Why the violence in Bambari? Situated in the centre of the country, about 380km north of the capital Bangui, Bambari has experienced an upsurge of violence in recent months. For years, Bambari was known by the UN as a weapon-free city, where the presence of armed men was forbidden. Its strategic position, both as the main economic centre of the country and a mining city, has led armed groups, including UPC militants and Anti-balaka militia, to fight for control of natural resources. Bambari is divided into two, along religious lines, by the Ouaka River: the Christian community on the west side, the Muslim community on the opposite east bank. The Catholic compound is located in the Muslim neighbourhood, where UPC militants are active, despite the presence of two MINUSCA (UN peacekeeper) contingents, from Gabon and Mauritania. Since May, the compound has been attacked three times by armed men. Some have attributed Friday’s attack to UPC, though the group has denied responsibility.